Meet the fish of the river Wandle! Come down to the river Wandle, and see what fish we find! Learn more about fish in London’s rivers and how to identify different species. The middle Wandle contains a selection of coarse fish including barbel, chub and dace. 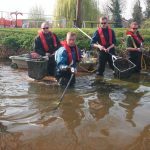 Fishery officers will be carrying out a fish survey, by wading in the river enabling us to understand the fish populations on the Wandle. The fish will be weighed, measured, a scale taken for age analysis, and then released unharmed back into the river. This method provide quantitative and semi quantitative assessments of the fish populations in the river.